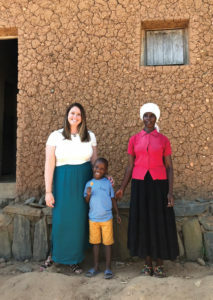 Warren Averett LLC employees Clint Freeman of Montgomery, above, and Marissa Marshall, below, made some solid connections in June when they visited Rwanda youngsters being supported by monthly donations through Compassion International. Lots of companies, when asked, will write a check for a good cause. Four employees of Warren Averett LLC, the nationally ranked accounting firm, went a step further last June, flying to Rwanda to meet children they’re sponsoring through an international charity. The company has been a partner of Compassion International since 2008, allowing employees the opportunity to sponsor children in Rwanda. Compassion is a global organization that seeks to meet the physical and spiritual needs of children in impoverished areas across the world. A monthly monetary donation covers a specific child’s education, nutrition and other needs. Warren Averett employees sponsor all of the children in two full Compassion villages and some of the children in a third village, accounting for more than 140 youngsters. The company also offers sponsored trips to visit the children, which is what Clint Freeman, Marissa Marshall, Tiffany Johnson and Frances Boney signed up to do. The four represented Warren Averett offices in Montgomery and Birmingham, as well as Tampa and Atlanta. They visited four Compassion villages: two of which are those sponsored by Warren Averett, one that the company hopes to sponsor in the near future and one Compassion urban center. As you might expect, people who work for an accounting company appreciated the chance to see what their dollars were accomplishing. Rwanda, a landlocked East African country, is among the smallest countries on the continent, with amazing landscapes and wildlife but also fierce poverty. Coffee and tea are the main cash exports; tourism is growing. Warren Averett CEO Mary Elliot says the company looks forward to continued good works with Compassion villages and children in Rwanda.